Mixed media, 6 x 12 x 12 in. Styrene, acrylic, cast neoprene, paper, gouache, polyurethane foam, ash, talc, starch, acrylite, vinyl film, copper, wood, steel, lighting, BK7 glass. Diorama viewed through 2 in. (5 cm) window, 14 ¾ x 11 ¼ x 9 ¼ in. Encyclopedia Britannica, archival pigments and ink, 8.5 x 40 x 11.5 in. Vintage book, watercolors, acrylics and inks, 11 ¼ x 15 x 3 ¾ in. 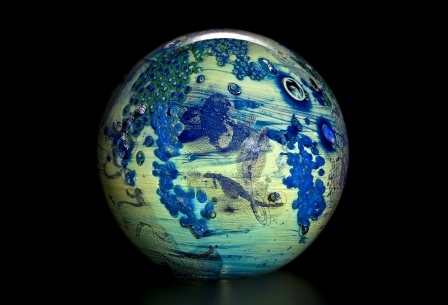 Glass, 10 3/4 in. dia. Found traveling case, soil, stones, resin, artificial foliage, fluorescent light, water, 10 x 13 x 8 in. Supported by the Deborah G. and Charles M. Royce Exhibition Fund and Connecticut Office of the Arts. Continuing the Bruce Museum’s tradition of small-scale exhibitions at holiday time, Small Scales: Lands of Enchantment explores the works of contemporary fine artists working in minute scales with a focus on the natural world – landscape, seascape, and microcosms of the imagination. While the creation of miniature scenes itself is not a new concept, contemporary artists use small works to encourage closer looking, drawing the viewer in so he or she becomes aware of a deeper message only after first being lured by the finesse and beauty of the piece. In this exhibition, works are made from old books and repurposed suitcases, found objects and handcrafted items, glass and a living tree. The subject matter ranges just as widely from highly researched environmental and political issues to fanciful imaginary worlds and nostalgic memories of the family homestead. Lands of Enchantment showcases the Bruce Museum’s past with the display of natural history dioramas made by former director Paul Griswold Howes. For young and old alike, miniature landscapes present a virtual reality that transports us to another place and time. Matthew Albanese’s fascination with film, special effects and movie magic began early. As a child, he loved miniatures and created scenarios set with household objects. Professionally, Albanese initially worked as a fashion accessory photographer. This small-object specialization is known in the retail trade as “table top photography.” From there a happy accident of spilled paprika sparked a creative excursion into natural dioramas made of unexpected materials and found objects. David Beck is a master carver and sculptor who references diverse media, art history and genres in his work—from the refinement of 18th-century automatons to the whimsy of folk art. Outward simplicity belies the treasures within his delicate mechanical sculptures and wondrous intricate box creations. 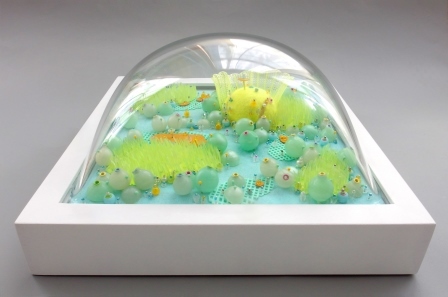 Sally Curcio’s Bubble worlds are a modern take on an old fashioned snow globe, full of whimsy and imagination. At the same time they can be seen as a commentary on the bubbles in which we live, isolated and under a microscope for all to examine. Each domed landscape crafted of found objects and dollar store treasures evokes a perspective we have only recently become accustomed to seeing—the vantage point of an orbiting satellite image accessed on Google Earth or from an airplane window. Paul Griswold Howes, naturalist and past director and curator of the Bruce Museum, left a number of dioramas he made in the 1940s to the collection. Two are displayed here exemplifying the history of the Museum as an institution devoted to the intersection of art and natural sciences with a scientist’s perspective of an idealized natural environment of frolicking beavers and stoic moose. An elegant escape into another world describes the wall-imbedded dioramas by Patrick Jacobs. 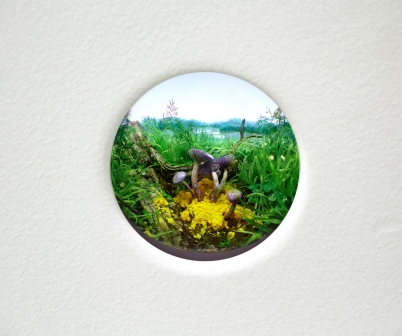 Viewed through a lens that magnifies realistic-looking flora created with man-made materials, we are treated to a voyeuristic experience of a not-so-natural vista. Blending science and art, Jacobs painstakingly researches plants and their habitats to inform the fabrication of the microsculptures. Equally important is his research on the optical quality of the lenses that alter the observation of the art. That Canadian artist Guy Laramée’s career includes time as an author, playwright, scenographer and director is evident in the theatrical flair his sculpture possess revealing his understanding of drama and scale. Made from books, Laramée’s landscapes are a commentary not only on the erosion of knowledge but also on the decline of our environment. The act of carving away at the paper mimics the natural erosion of land over time. Where we once were able to fit our knowledge within the covers of a book, human wisdom expands so rapidly that encyclopedias are out of date even before they are printed. Katja Loher creates video “miniverses.” These compelling works appear on the surface as merely mesmerizing kaleidoscopic patterns but the underlying message speaks to a deeper meaning of ecological issues that face humanity and our planet. Another book artist, Kerry Miller, approaches the tomes from a different aspect. Collaborating with the past by using old books rich with illustrations, she brings the outdated books to life by reassembling the hand-colored images to express the essence of the book; a précis of its contents seen without turning a page. Lori Nix considers herself a faux landscape photographer. While the ultimate creative outcome may be the unretouched photograph, the models that she and Kathleen Gerber create as the subject of the photo are works of art unto themselves. Each takes several months to build after extensive research and are destroyed when the photograph is finished. Raised in calamity-stricken Kansas, experiences of devastation are the foundation of her work. Nix expresses with a wry sense of humor what a post-Armageddon world looks like when Mother Nature takes back what man raised up and the natural entropy that would occur. Glass artist Josh Simpson translates his wonder of the universe into sculpture inspired by the aurora borealis, an approaching thunderstorm, or a misty sunrise. A modern day alchemist, Simpson practices and experiments with a highly scientific process, mixing chemicals and elements with varying properties and melting points to create imaginary planets with landmasses, oceans, mountains and valleys. Blane de St. Croix explores land issues, the relationships between nations, corporations and populations, and vanishing landscapes due to political, economic and social circumstances. Heavily researched with extensive travel and on-site investigation, de St. Croix reduces complex issues down to a manageable size, a duality that intrigues him. Mixing messages in this way creates a tension in his work that belays its beauty. Kathleen Vance has a strong connection to the Chesapeake landscape of her childhood home. 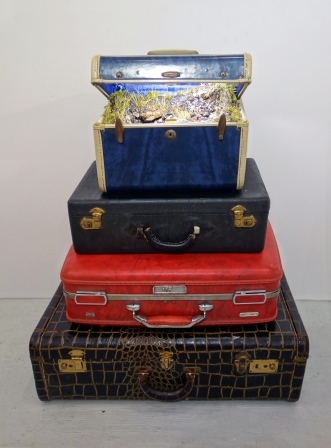 Known for her environmental pieces and represented in this show by works from her Traveling Landscape series, Vance utilizes found and reclaimed suitcases, steamer trunks and valises to create “portable” landscapes, frequently with flowing water. These pieces extenuate the desire for “untouched” natural environments, and the claim and proprietorship that are placed on plots of land, which carries over to water rights. Julian Velasco is a bonsai professional and curator of the Brooklyn Botanic Garden's C.V. Starr Bonsai Museum’s world famous collection of over 300 bonsai. Julian, who has designed, developed and maintained some of the best bonsai in the US, is growing a penjing especially for this exhibition.